The Alpha Grillers instant read thermometer is a great product with some interesting features. Unique in its design, and the options available, it is easily in the top three best instant read thermometers for the money. The foldable probe acts as the power switch, which seems like an obvious feature once you hear it, but is not seen often with instant read thermometers. The Alpha Grillers thermometer comes in a bright red color, making it easy to spot in crowded utensils drawer. 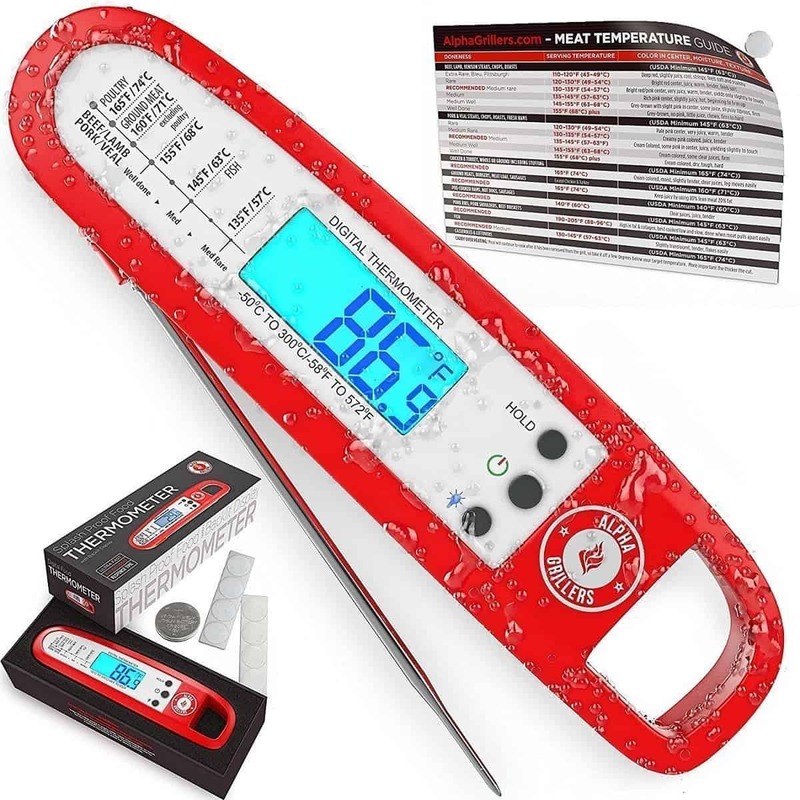 It features a 180-degree fold out temperature probe and conveniently lists the recommended cooking temperatures for common foods such as ground meat, fish, and poultry right on the front of the body for quick reference as you are cooking. If you are a chef looking to up your cooking game, an instant read thermometer is always a great start. The accuracy and convenience it offers are irreplaceable. 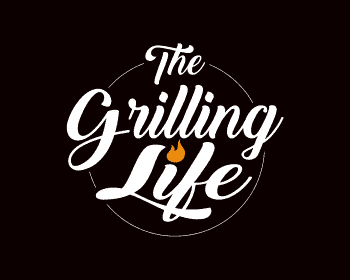 The Alpha Grillers Company is a small family run business that has made it their mission to bring quality kitchen and BBQ equipment to grillers and chefs everywhere that will last for years. They strongly believe in listening to their customers to provide excellent products with an elegant design that they will appreciate. They are known for their above and beyond customer service and excellent warranties for most of their products. 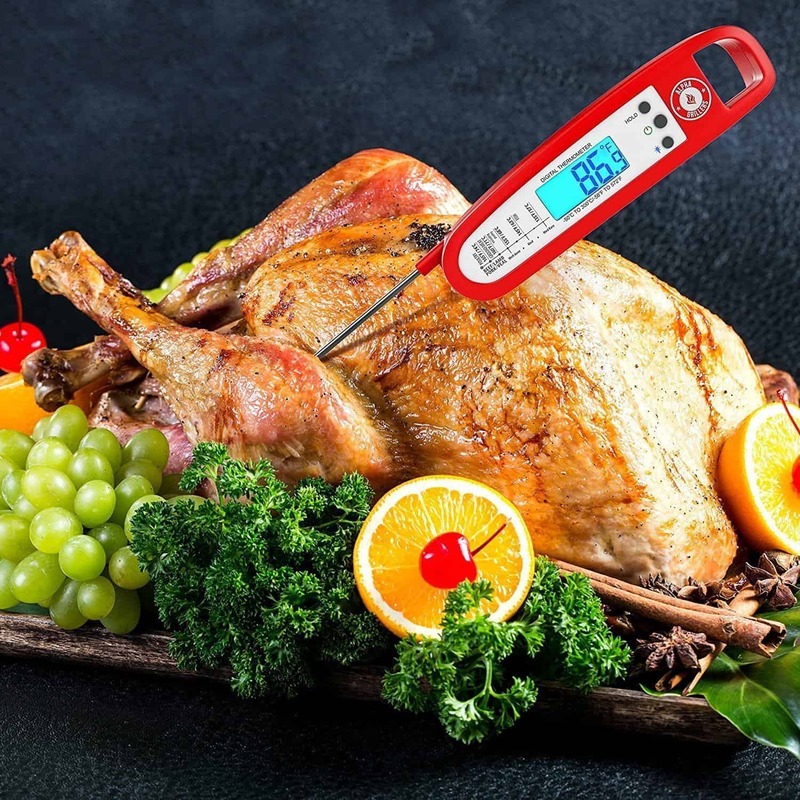 The Alpha Grillers Thermometer is a perfect example of their customer dedication and offers an accurate way to cook, and a convenient way to check temperatures all at a very low price. Anyone that is still using an analog thermometer or worse yet, not using a food thermometer at all needs to check out instant read thermometers. The convenience, accuracy, and relief from food safety concerns they give you are worth the purchase. The Alpha Grillers instant read thermometer offers its own style of conveniences and comes through with an affordable price as well. The accuracy of the thermometer will help you cook your food to the perfect temperature. Since it is accurate to ± 1°F, you are sure to get as close to the perfect temperature as possible. The Alpha Grillers Thermometer also has a recommended temperature guide printed right on the front face. This is a huge benefit for newer cooks. You don’t need to worry about googling your meat temperatures because they are right on the thermometer. With a magnet attached to the back, you can store the thermometer easily on any metal surface. It is bright red in color, which makes it easy to find in any cluttered drawer. To turn the thermometer on, simply unfold the probe from the body. It opens to 180°. When the probe is opened, the thermometer is automatically powered on. Whenever you want to turn it off, just fold the probe back against the body. The thermometer will automatically turn itself off. To check the temperature of a food, insert the probe into the center of the food. This ensures you are checking the correct temperature and not the temperature of the grill or another heat source. The thermometer will read and display the temperature on its big display within four to seven seconds. The temperature can read in either Celsius or Fahrenheit. This is controlled by pressing the C/F button on the body of the thermometer. If it is difficult to read the display because you are reaching far back in the oven, the sun is glaring, or it is positioned strangely, no worries; simply press the helpful ‘hold’ button to lock in the temperature that is being displayed. You can then pull the thermometer out of the food, and it will continue to display the temperature that it read in the food. The ‘hold’ button is a great tool, and as easy as pushing the button. When you are done using the thermometer, make sure to wipe off the probe well. Don’t submerge the body in water as the housing is not watertight, but clean the probe off very well in order to avoid cross-contaminating food. Perfect for indoors or out, the Alpha Grillers instant read thermometer has several great features that make it a high-end thermometer, even though it comes at a cheaper price. The first feature to speak about is, of course, the accuracy of the thermometer. The entire reason cooks would want a thermometer is to have accurate temperature readings of their food, right? The Alpha Grillers thermometer reads within ±1°F of accuracy between 4°F – 392°F, which is very solid for an instant read thermometer. It isn’t the most accurate thermometer you can find on the market, but anything at ±1°F or under is very good in my opinion. If you need something more accurate than that, be ready to increase your budget for a thermometer. Alpha Grillers Instant Read Thermometer is quite fast being able to provide a readout in four to seven seconds. This means less chance of burning hands as you wait for the temperature to stabilize over a hot grill or oven. If you have ever used a standard thermometer while checking food, you understand what a great benefit this is. The large and clear display screen measures 1 1/4″ wide x 3/8″ high with digits filling the entire screen. For low light conditions like grilling in the evenings or a dark oven, the Alpha griller features a bright backlight making reading the display a breeze. The 4 1/2” probe folds out 180-degrees and helps to keep a good distance between the heat and your fingers, so while checking the temperature, you won’t be burned. The probe folds back in against the body also for easier storage when not in use. The hold button is one of the best features on the thermometer. It gives you the option to ‘hold’ a temperature on the display screen until you are done reading it. This is great for checking awkward foods where you need to position the thermometer at a strange angle. Whenever your temperature is being displayed, just press the hold button and the temperature will continue to display until you press the button again. The automatic power switch is a great feature too. The thermometer turns on when you pull the probe away from the body and turns off when you close the probe again. This is very convenient for when you are using it multiple times in one cooking session. You don’t need to worry about pressing buttons with contaminated hands. It also makes saving your battery life very simple. Anyone who has left a thermometer on and depleted its battery by accident can appreciate an auto-off feature. The Alpha Griller thermometer automatically turns off after ten minutes of non-use. This is another great feature for saving the battery life. The heavy-duty magnet on the back of the thermometer is also very convenient feature. Between uses, you can easily slap the thermometer onto your fridge, oven, or other metal appliance. That makes it easy to find when you need it again, and out of the way in the meantime. The Alpha Griller has a temperature range from -58°F to 572°F (-50°C-300°C) making this a worthy thermometer for all kinds of uses. A thermometer that can read below freezing temperatures and is able to read extremely high temps is a truly versatile thermometer indeed. Printed on the side of the thermometer is a guide to safe meat cooking temperatures. This shows the FDA’s recommended temperatures for several types of meat. Now you don’t have to search for the temperatures, instead, they are right in front of you! Additionally, the thermometer comes with a food temperature chart that you can stick to the fridge or wall. The Alpha Griller food thermometer is powered by one Lithium Metal button battery that comes included. Who Is The Alpha Grillers Instant Read Thermometer For? 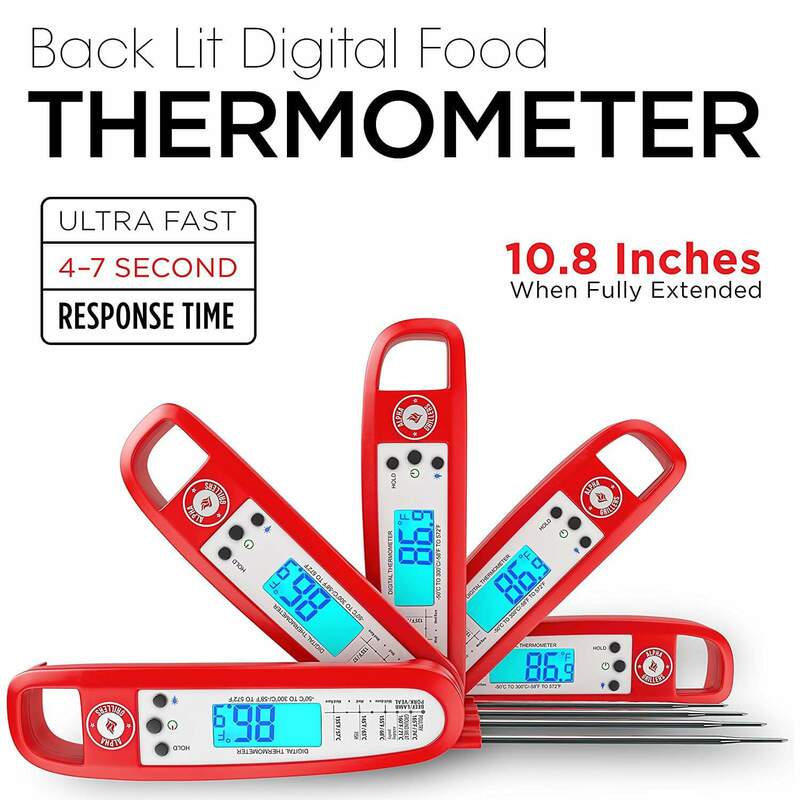 The Alpha Grillers instant read thermometer is a perfect thermometer for the experienced cook or people who are new to the kitchen and specifically grilling. The accuracy allows the newer chefs or grillers to get to their ideal cooking temperatures. It also shows them the recommended temperatures for different types of meat and gets the job done. The hold button and the power switch both make it a great product for more experienced cooks. After using an analog thermometer for years, I totally appreciate how useful the ‘hold’ button is. That is what the makers at Alpha Grillers thought too, so they built a product to offer it. With the wide temperature range, the options are almost endless. You can use this for checking bath water, deep frying foods, candy making and even brewing beer and wine. If you are a griller who likes to smoke meat, you might check out a wireless remote thermometer that offers multiple probes. A wireless thermometer might be a better product for you because it will allow you to read several temperatures at once. This lets you follow the temperature of your food and your smoker from a distance at the same time. Also, if you tend to forget about your food while you are cooking, a thermometer that can stay in your food and alert you when it gets to a certain temperature could be a better option. 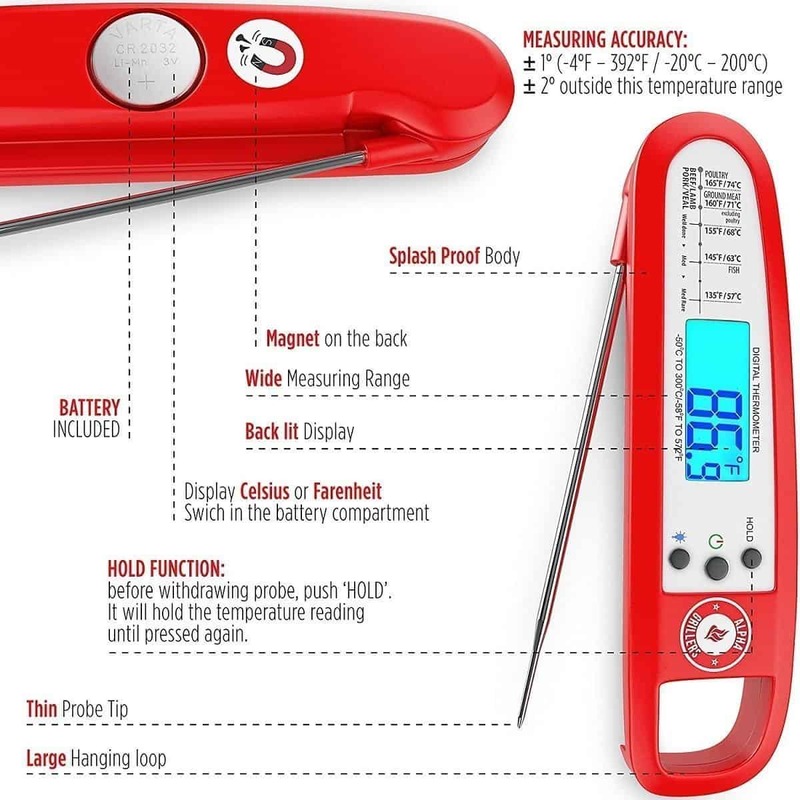 If you are looking for an instant read thermometer that offers the latest and greatest features along with superior accuracy and read times, check out my #1 rated recommendation, the Lavatools Javelin PRO Duo here. While the Alpha Griller is excellent for its price, there definitely are higher quality products out there. Of course, these products will begin to increase in price quite dramatically, but they will have some awesome features that just aren’t offered by a thermometer in this price range. Accuracy, speed, and a great ‘hold’ feature are all the biggest pros to buying the Alpha Grillers Thermometer. The company’s focus on customer service and the lifetime warranty of the product are also factors that can be added to the pros list. The downside is not that it is a bad thermometer, but just not quite as high-end as some more expensive thermometers. This is no surprise, for its price range. It certainly shouldn’t take away from the overall quality of this thermometer. 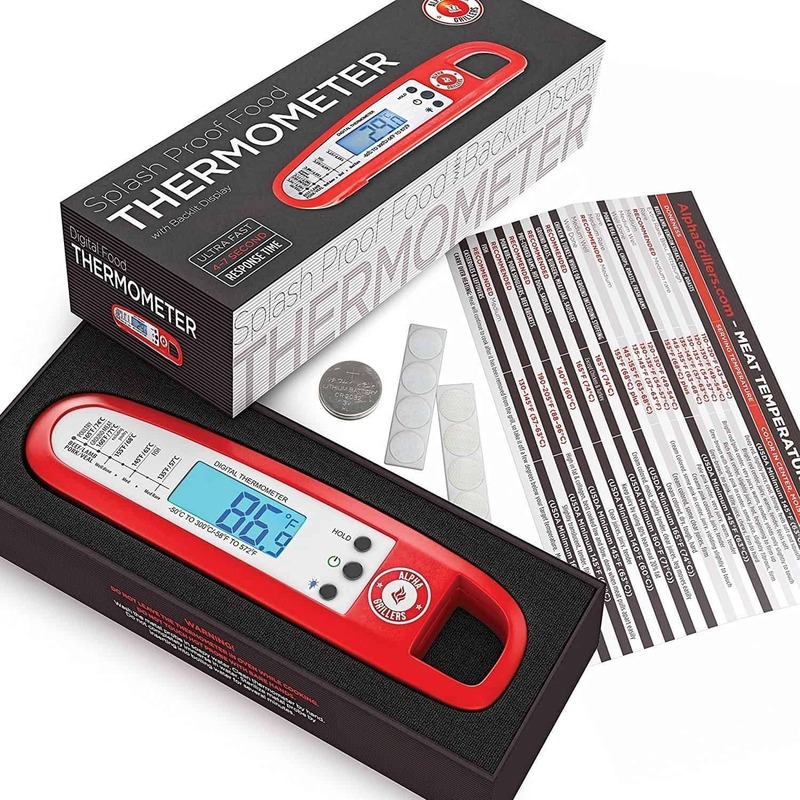 This thermometer comes in around $13 and it comes with a lifetime, money back warranty! Alpha Grillers is one of the most reputable brands when it comes to grilling and cooking utensils. Not only do they go out of their way to ensure the quality of their products, they provide excellent customer service if you should ever need it. Something that many of the bigger companies don’t bother as much with. Definitely check out this instant read thermometer. It should easily be in your top three choices for this price range. Don’t let the price fool you though, just because it is less expensive doesn’t mean it is a worse product. The Alpha Grillers instant read thermometer has a lot to offer. They just sell it at a lower price than many competitors do. I hope this Alpha Grillers Instant Read Thermometer review was helpful for you. As always, if you or someone you know is interested in grilling thermometers or you find this information useful, please consider sharing it with your grilling friends and on social media! If you would like to leave a comment or have a review of your own to share on the Alpha Grillers thermometer, please do so below. We always welcome your input.